Great Deal on NOVEMBER at A.C.T. I saw November on Sunday. It's Mamet at his best. Andrew Polk as President Charles Smith is a craftsman at Mamet-speak. He's cynical, hillarious and outrageous. His straight man, Anthony Fusco as his aid Archer Brown plays off of Polk with precision and displays a dry sense of humor that will leave you in side splitting pain. The good kind. November's President Charles P. Smith has a deal for you! Forward this offer to a friend, or treat yourself to a repeat performance. Don't get stuck on the "piggy plane," catch November before it closes! Have something to say? Tell us on our Facebook page or on Yelp. Become a fan of A.C.T. and share news about upcoming events, check out our video trailers, and much more. *All tickets subject to availability. Not valid for previously purchased tickets or exchanges. 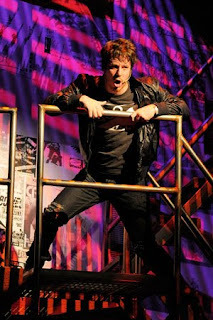 Berkeley Rep did it again with American Idiot. The set is amazing, the cast puts out more energy than seems humanly possible, the music hard and loud and wild. This is a great show. With a few tweaks in the dialogue, I could see this being a big hit on Broadway.